Only a couple of weeks until the next leg of NITL tour. You guys pumped? I don't see any reason to be pumped any more. We know what's in store. The most interesting thing I've heard about Guns recently, in fact the most interesting thing I've heard about Guns since the initial reunion, is that Rose might have/might not have been filmed (for a documentary) reliving himself into a bucket - that is how interesting this band are right now. I’ve been extremely skeptical that we’ll ever get a new release but I popped CD into the ol tape deck (jk, Google Play Music) yesterday for the first time in a awhile and the first thing I thought of is, if Axl has any pride whatsoever, he needs to release at least the songs he’s talked about. Am I the only one who thinks Guns covering Elle King would sound cool? 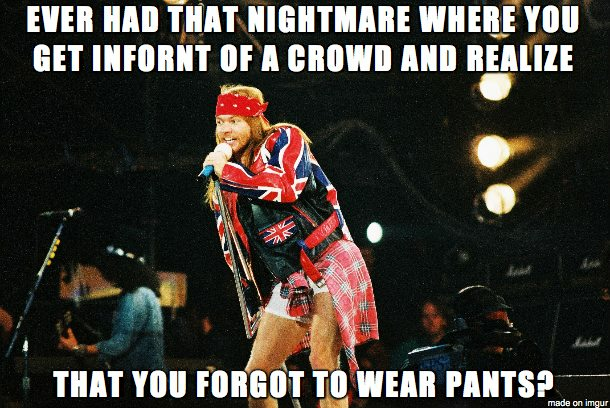 Hearing Axl on something like Last Damn Night at full rasp would be epic. A KFC bucket or a 80s metal bucket? It's a great album and a great song for sure. I saw this thumbnail on YouTube and thought it was Axl. Uncanny, no? Slash has spoken a few times now about playing Chinese material, but has Axl had any comments about Slash playing any of it? Taipei 2009 was the best performance of This I Love. Performed half a step down, it was hauntingly beautiful. Every available recording sounds like it was recorded from the bottom of a bucket. A soundboard would be my holy grail. Dammit. I hate when Axl does something great and we can't get a good recording of it. Things I would kill for: A soundboard recording of Sailing. I'd kill for a song where Axl sings like that. Probably can't anymore, but whatever. I'm betting if new material comes out, it's gonna be previously recorded CD II stuff, reworked with Slash and Duff. Can't see Axl having the ability to have his voice again in studio; unlesss he just does the ACDC belting.